The SMOK Alien 220W is a kit from Chinese manufacturer SMOK, or Smoktech. 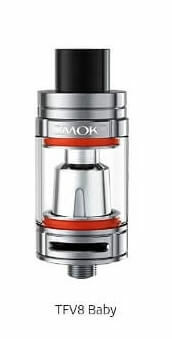 Many people cringe at the idea of purchasing something from China, but the SMOK Alien is a shining example of the technology and hardware that tech giants in China can produce. With un-compromised quality and innovative additions, the SMOK Alien kit is something that you simply cannot miss if you’re a fan of mod vaporizers. 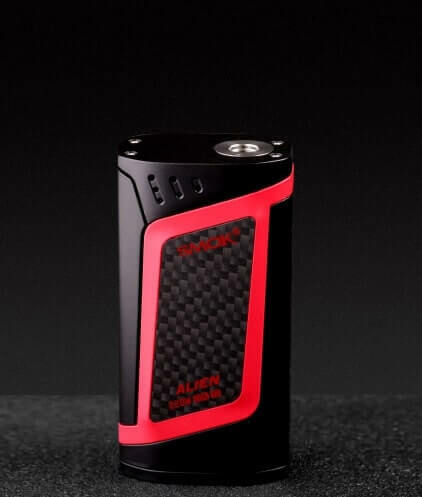 You will need to be a pretty advanced vaper to take advantage of what the Alien can offer, if you are not you would be better suited to one of the simpler vape devices we have reviewed here and save your money. These vape devices produce similar vapour volume but are easier to use day to day and don’t require the same level of knowledge. The SMOK Alien comes with the usual additions. It contains the Alien 220W box mod itself, a Baby Beast tank and two Baby beast Smok coils. There’s a spare glass tube for the tank (extras are always appreciated) and some o-rings for the tank. There’s a USB cable that can be used to update the mod’s firmware as well. Of course, there’s also a user manual which should be read if you want the best from your Alien kit. The only downside to this rather generous box of goodies is that there is no screen protection for the OLED display. While it seems like something small to complain about, all it really needs is a small bit of film to protect it from scratches. As a company that produces such high-quality products, it’s strange to think that SMOK has neglected to include such a small detail that could have completed the whole un-boxing experience. The new Smok Mag, a “gun styled” 225 Watt mod appears to have overcome this issue and now includes the protective film! In terms of design, the SMOK Alien 220W is a looker. Its sleek, compact and comes in three unique classy colours. For a unit that requires two 18650 batteries, it’s surprisingly small. It shares a lot of design choices from other popular vaporizers which is a nod to SMOK’s desire to appeal to wider audiences. The overall finish and feel of the product are that of something you’d expect in the higher-end of the price range for vaporizers. The matte black finish and zinc alloy case feel amazing and it’s a joy to have in your hands. However, SMOK isn’t just taking cues from other popular vaporizers. Something that sets the SMOK Alien 220W apart from the competition is the large OLED screen that shows everything from the selected vaping effect to the current wattage and temperature settings. You’ll want to try and keep this well-protected because it can easily scratch. Although it doesn’t necessarily affect the usability, it does make your unit look a little run-down if you don’t look after it. 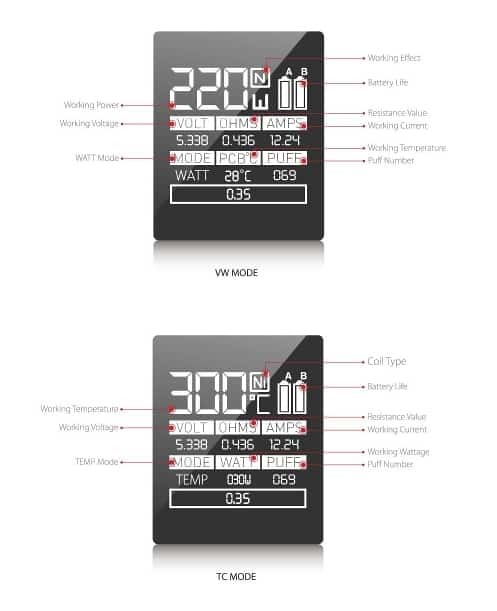 While having a screen to display information isn’t anything new, it’s certainly unique that the SMOK’s screen shows a wealth of information at the same time without having to press any buttons. The only drawback to this is that the SMOK’s screen may seem cluttered, but once you’ve used it for a while you can easily adapt to it and you’ll appreciate all of the information being on the screen at once. 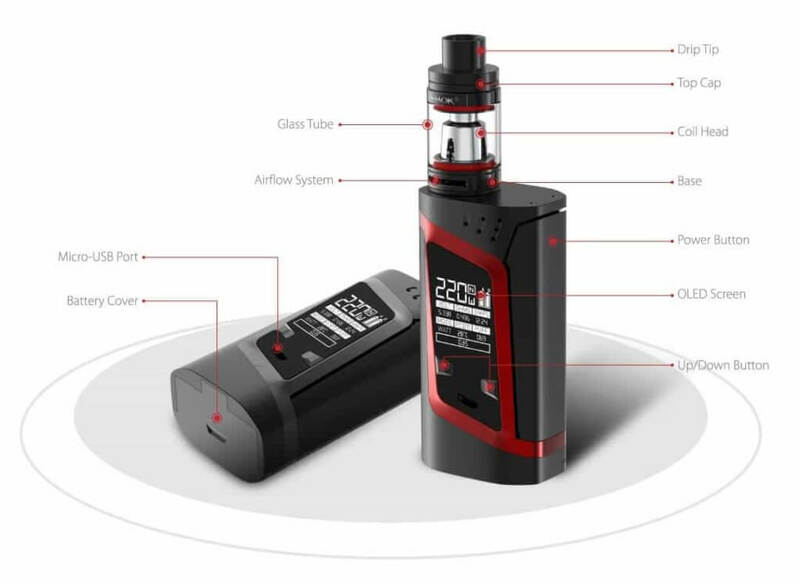 I would point out here that generally speaking, devices like the Smok Alien and Cool Fire and other mod devices are aimed at the more avid vaper. My personal aim is to stay off cigarettes and I am not concerned with blowing out huge vapour clouds (which incidentally consumes a lot of e liquid so cost is a factor). Another unique feature of the SMOK is the ability to upgrade the firmware at a later date. For some people, this may seem like a strange addition. Many SMOK Alien owners are content with the performance of their device, so they aren’t likely to use the firmware-upgrading capabilities. This is especially true if you’re not using the temperature control mode. 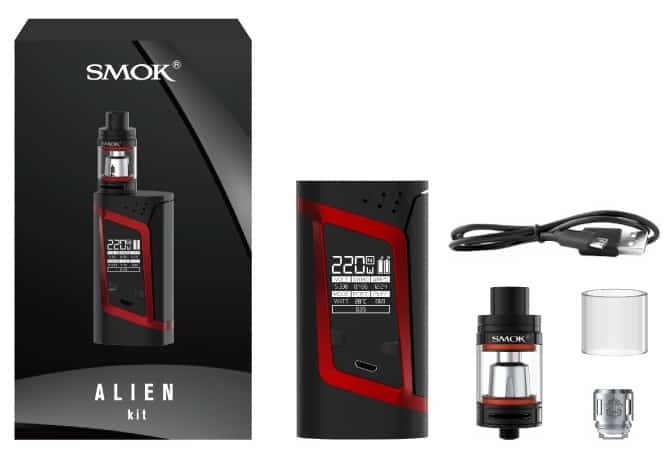 If you are an advanced user, and you should be if you are going to use this device, then you’ll be happy to know that upgrading the SMOK Alien’s firmware is relatively simple, but it does require a bit of knowledge with your computer. One downside of this is that you might break your SMOK Alien if you’re inexperienced with firmware upgrades, but if you’re an advanced user then there’s little chance of this happening. Of course, all of these features and additions would be rather useless if the mod itself didn’t perform well. With its 220 watt maximum output, it should be more than enough for most users. It’s efficient on the battery too, so unless you’re an incredibly active user there’s only a small chance that you’ll burn through the entire battery in a day. As with most advanced mods, there’s a lot of customisation to tweak on the user’s side. If you want to change the temperature or wattage, then that’s something you can do. The flexibility of the SMOK Alien is really one of its biggest selling points. It’s versatile, flexible and no matter how experienced you are, there’s a setting suitable for you. However unless you want and need advanced functionality from your vape there maybe better and less pricey solutions. You can use it in so many different ways thanks to the options given to you, so don’t be afraid to experiment when you get your hands on one. 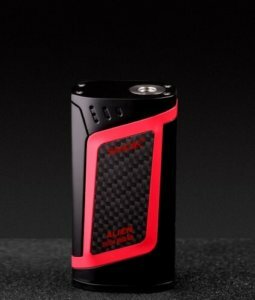 So is the SMOK Alien 220W worth the price? Considering all the features, it’s fairly inexpensive and offers plenty of great features that will appeal to advanced users. 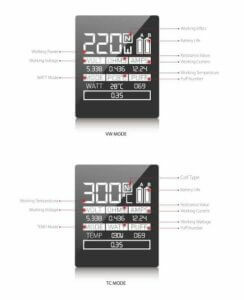 The screen is arguably one of the most compelling features of the SMOK Alien because it just shows so much information in a single place. Of course, for beginners, a lot of this information is going to look confusing and cluttered, but it’s a great way to keep track of how your mod is doing. The lightweight design and comfortable form factor make the SMOK Alien the perfect candidate for advance users looking for a more convenient box mod to handle. If you’re due for an upgrade, then the SMOK Alien is the best advanced vape mod available on the market. With so much customisation potential and upgradability, it’s also great value for money. There’s little at this price range that can offer such value, making it easily one of the best mods out there, period. For advanced users only! The Smok Alien is what you want to be seen with!